If you are looking for a counselor or need to locate one for someone, this page will guide you. Please read carefully. Due to Rick’s ongoing oversight of the ministry, he is not available for counseling sessions. If you would like to access Rick, you are welcome to (1) buy him a cup of coffee or (2) join his member site. If you would like ongoing coaching for yourself or your team, please go to our Coaching Page to learn more. Our member site is not a counseling site for ongoing and unlimited advice. It is a training site where you can receive guidance from our team. The Counseling Solutions Group, Inc. is not responsible for any outcomes or results from the counseling that you receive from any contact you make from our site. We believe counseling is a good start toward the process of change, but we also believe counseling alone is not enough for the long-term transformation. Situational difficulty does not come to you quickly or all at once. It is typically the accumulative effect of many years of challenges. It will take more than a season for a person to successfully work through the necessary changes to live effectively in God’s world. If I asked you to lose one-hundred pounds over the next few months, you would envision significant lifestyle changes coming your way. You would also expect the change process to involve more than two hours per week. There is no magic in weight loss. It takes work. In like fashion, your spiritual well-being is similar to the physical challenges needed for effective change. Your counseling must be comprehensive and geared toward realistic and measurable goals. Someone once said if you continue doing the same things you have been doing, you can expect similar results. In that sense, your future can be predictable by looking at your past. The good news is if you determine to make radical changes in your thinking and behaviors, you can expect complete and satisfying lifestyle changes. 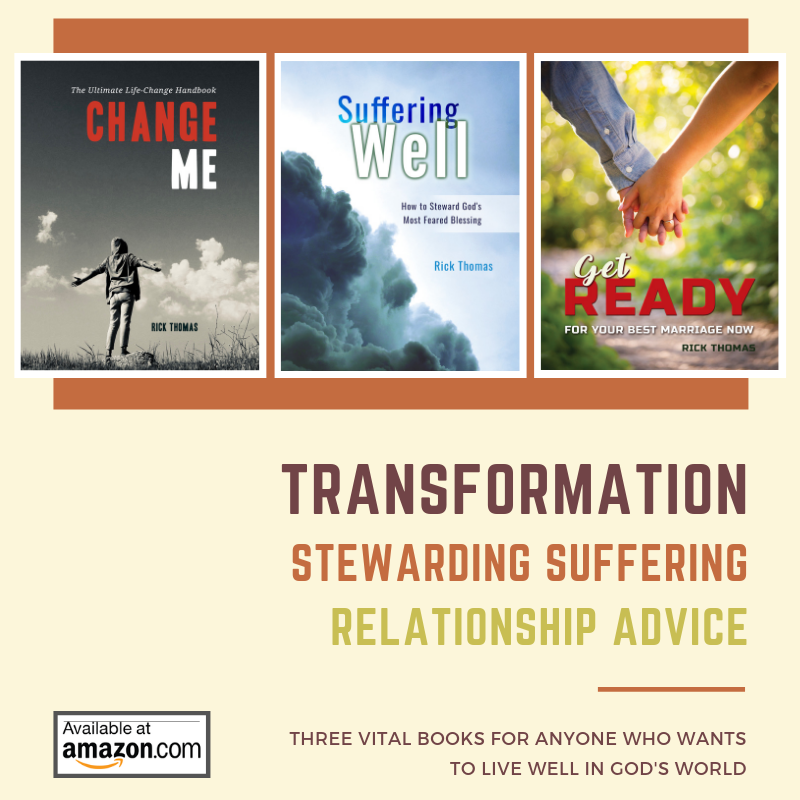 Your transformation requires more than counseling. We suggest you become a member of our training site. It is the most inexpensive and effective way for you to receive ongoing care. Though we do not counsel on our member’s site, you will be able to access Rick’s lifetime work. Our website is an “all you can eat” sanctification center that is the perfect complement to your ongoing desire to change.